In 2014, Daniela Kapralova, a Rusyn photographer and a curator at Sninsky Kastiel in Snina, Slovakia, put together a little book about a woodcarver from Čabiny near Medzilaborce – Andrej Gavula. Beautiful photographs of the woodcarvings accompany her warm but erudite interpretation of the artist’s life and work. In June 2014 The Pedvale Open-Air Art Museum in Latvia hosted the 7th International Conference on Contemporary Cast Iron Art. It is a globally important academic event that, among other things, enables contemporary artists in the field to work together and to contribute their ideas to the discussion about the influence of the sculptural iron casting on contemporary art and landscape transformation. One of the permanent exhibits will be constructed on-site, drawing an inspiration from a Japanese land art movement Mono-Ha, by a sculptor born in Pittsburgh, Pennsylvania, Daniel Postellon. For Postellon, the sources of creativity are innumerable: cosmic events, art movements, science, history, geography, religion, works of other artists. His work is thoroughly premeditated, it is informed, and in its attempt at representation it becomes metaphorical, layered. The very act of combining natural and artificial materials enables him to draw from the position of humans as part of the nature, but also to make a statement on their relative separateness as brought about by their transformation of natural resources. Collaborating with other artists, experimenting with techniques (e.g. making iron casts from origami or bubble wraps) and fusing traditions that are often thousands of years apart makes his otherwise contextually-bound wooden carvings and iron casts escape the constraints of time and place. I am sharing with you several of my favorite pieces whose execution shows the artist’s contemporary awareness of the movements long past. Olena Mandychova (Olena Mandičová in Slovakian) was born in Giulesti, Romania in 1902. She was the first professional sculptor among Rusyns in Czechoslovakia and only 25 years old when T.G. Masaryk, the first president of the Czechoslovak Republic, sat for her. Consequently, the bronze statue that now doesn’t exist anymore, was her masterpiece. In the 1930s she made sculptures and memorial busts of Rusyn political and cultural activists (A. Dukhnovych, A. Dobriansky, A. Mytrak) erected in a number of towns in eastern Slovakia and western Ukraine. Mandychova also created pieces showing aspects of the traditional Rusyn life (a shepherd, a woodcutter). The turbulent years of the Second World War, exile, Communism and a serious illness ended her career and “she spent the last 30 years of her life virtually forgotten while working as a cashier in a shop in the eastern Slovak city of Kosice”(1). 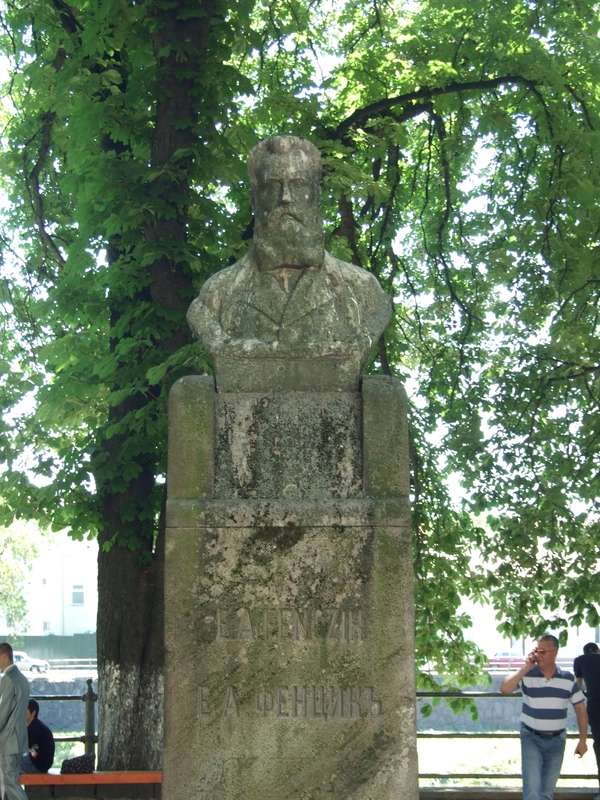 The statue of Alexander Dukhnovych in Presov, Slovakia, and Yevgeniy Fenczik in Uzhorod, Ukraine are probably the last surviving works. 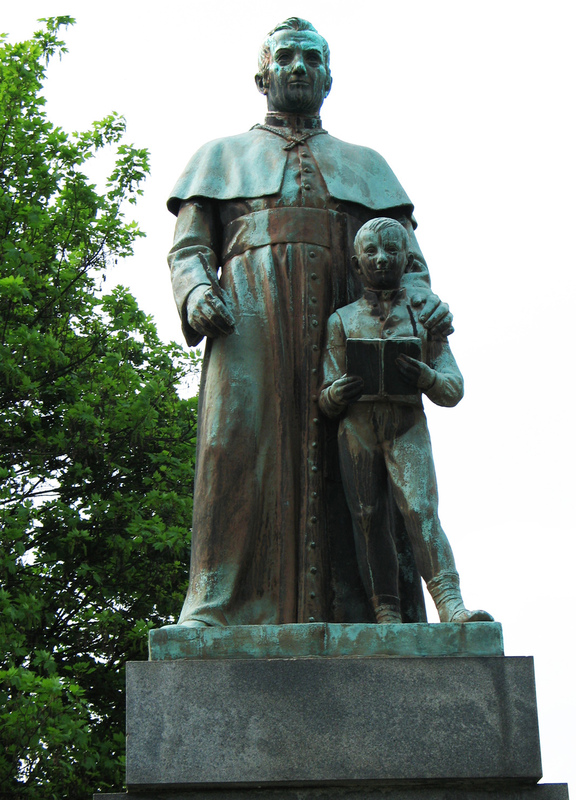 Other statues were taken down and destroyed by the authorities, or finished off by thieves. One of her other last surviving works is “The Winged Wheel” on the main train station in Bratislava that has been there since 1939. A random afternoon walk with my aunt took me to the recreation area in Ulič, a small Rusyn village in eastern Slovakia, hugged in by Eastern Carpathian Mountains in the National Park Poloniny. We found two artists who preserve natural and man-made creations in a unique way. The first is Jan Cokina (pronounce: cho-ki-na), a master wood carver, who created miniature replicas of the wooden churches in the Ulič valley – the famous wooden churches that dot eastern Slovakia. Many are still standing for him to visit, but with some he had to rely on historical drawings and photographs only, since they were dismantled or changed centuries ago, like the one that used to stand in Ulič, for example. Two of the most beautiful actual churches were moved to outdoor museums in Humenne and Bardejov, and so the need to somehow keep them in the valley resulted in this wonderful commission. Three of Cokina’s replicas, including the church in Ulicske Krive, were a part of an exhibit showcasing the Slovak Republic in Brussels in 2013. The second wood carver is Miroslav Gaľo, who also lives and works in Ulič. His carvings now add a perfect touch to the cultural and recreational area called “The Gateway To Poloniny” near a fishing pond surrounded by a buoyant greenery and a dreamy stillness. The landscaping around his expressive works is finished and the whole area was officially opened to public on October 6th, 2013. You are not denied the magical feeling of the fairy-tale world he managed to capture when creating the wood spirit, the water-man, the giant snail or the standing bear. This detailed animated carving was made by a contemporary Rusyn sculptor from Jakubany, Slovakia, Jozef Michňa. In his work, the spirit of the subject comes through and makes the carving alive. Notice the lowered head of the horse, the eyes showing a troubled emotion. When you click on the image below, you will be directed to a photo gallery showcasing the core project of Michna’s work called “Project FLOWER” (or in Slovak Projekt KVET) where, as he says, he explores how the universe can be grasped and represented: the micro and macrocosm, their elements, powers and characteristics. He achieves that through exploiting the interplay between the carved wood (as an intimate natural material) and light (an inherent part of the cosmos) that he allows in when he works the wood into such an extent that it loses its visual hardness, fullness and massiveness, and changes into something almost weightless, yet retaining its inherent properties as an element of nature. The surreal “quantum flower” present in every woodcarving becomes a symbol of our connection to the outer universe, in which we are one of its active elements, not deterministic parts.